Sometimes things just come together in unexpected ways, without conscious effort on our part. My recent reading explorations offer a perfect example of this cosmic convergence. Every time I visit my sister-in-law, I come back with a single book borrowed from her diverse and eclectic trove. Why only one? So I’m committed to finishing it before the next time I see her, and not have several books just looking pretty on my bookshelf without me getting through any of them. On my last visit, I brought back a hefty tome called Great Tales from English History, by Robert Lacey. It’s a quaint collection of stories, facts, legends, and speculation, about interesting episodes and characters from British history, spanning a wide swathe of time – from the prehistoric era all the way up to the 20th century. It’s written in a conversational style and divided up into manageable chunks, making it a very easy read. I had just gotten up to the time period after the Norman conquest and the reigns of William the Conqueror and his immediate successors. Just around this time, I happened to search for a suitable audio book to borrow from my local library so I had something to listen to on my daily walks. I had recently finished listening to I, Claudius, by Robert Graves (see my review in verse here), and was looking for my next historical mystery. I tried several searches but nothing came up, so on a whim I started plugging in the names of authors I had seen on a listicle. Typing in Ellis Peters into the search window brought up a single audio book called The Pilgrim of Hate, featuring the medieval sleuth, Brother Cadfael of Shrewsbury. Now this is where the convenient alignment of the planets comes in: by the sheerest coincidence, the Cadfael chronicles are set in the 12th century in the period of anarchy after the demise of Henry I – almost smack dab in the middle of the history that I was plowing through. Having thus been the beneficiary of happy circumstance, I took full advantage of both my print book (the aforementioned Great Tales from English History), and my superbly narrated audio book from the Brother Cadfael series. I had never explored Ellis Peters’ works before, and The Pilgrim of Hate has shown me enough to want to read more books from this series. Brother Cadfael is one part William of Baskerville (from Umberto Eco’s incomparable The Name of the Rose), one part Father Brown (GK Chesterton’s humble but uncannily insightful crime solver), and one part Brother Athelstan (from Paul Doherty’s classic detective series set in the 14th century). This is not to imply that Ellis Peters’ creation is somehow an amalgam of these other characters – he just happens to exhibit some of the same attributes that these other fictional sleuths do. Perhaps all things medieval share a common flavor, or perhaps it’s the association with the clergy that makes these characters what they are. The Pilgrim of Hate is what I call a gentle and unhurried read – akin to spending a lazy afternoon in the shade in one’s backyard, in perfect spring weather, sipping a lemonade (or perhaps something stronger), with no pressing engagements looming around the corner. The book, like its protagonist, takes its time to set things up, to give you a flavor of the milieu it inhabits, and to get you accustomed to its rhythms – and then, boom – it throws you to the wolves, as it were, with scant warning. What transpires next, is of course what you need to read this book to find out. And it’s not just the mystery of which dastardly villain is behind the murder, but also the intrigue of how things turn out in the battle of succession to the English throne. 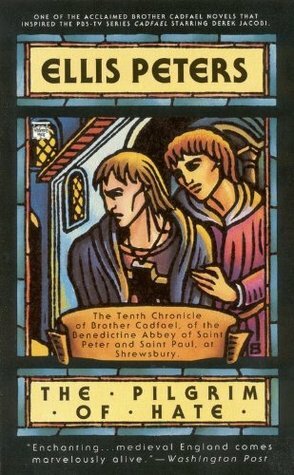 And Peters managed to make even the historical parts compelling for me, despite the fact that I already knew how it was going to turn out – thanks to Robert Lacey’s convenient set pieces on the events of the mid-12th century. And at the end of the day, isn’t that what great coincidences should be all about — to bring a little squeal of unexpected pleasure into a book lover’s life?